A beautiful collection featuring Swarovski crystals, enamels, quartz, glass and fabrics. Available in gold/pastels or gold/multi-brights . 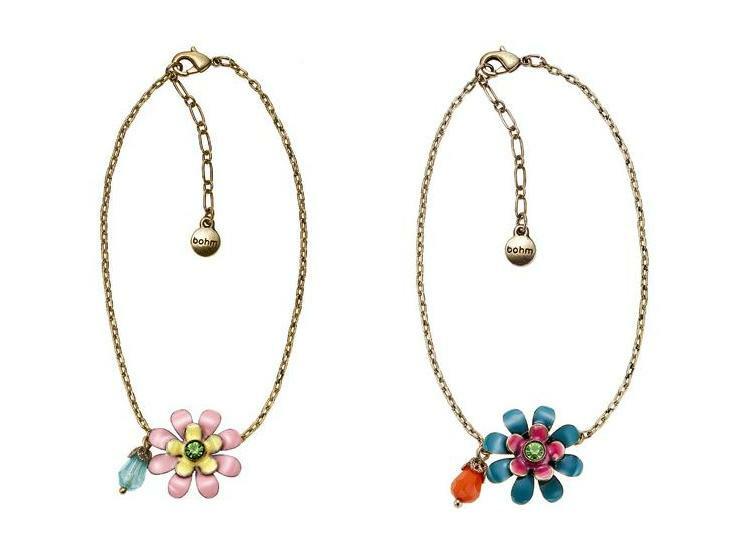 Double flower embellished ankle chain/anklet. Facted glass drop, Swarovski crystal and enamel. Adjustable length 22cm/8.75 inches up to 26cm/10.25 inches. The flower measures 2.2cm/22mm. Two 'Bobby Pin' hair clips with a flower and jewel decoration. Facted jewels, Swarovski crystal and enamel. Burnished gold plate. 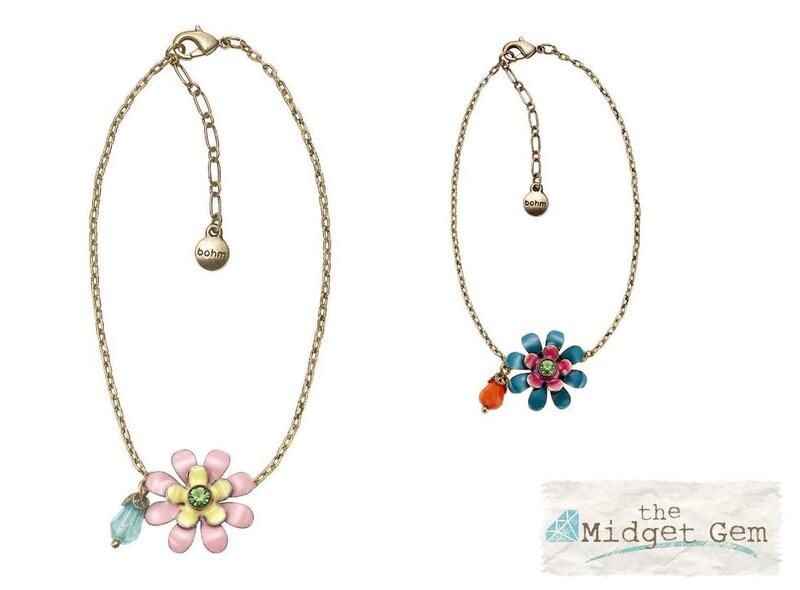 The flower and jewel measures 2cm/20mm. Bobby pins measure 5.5cm/55mm in length. 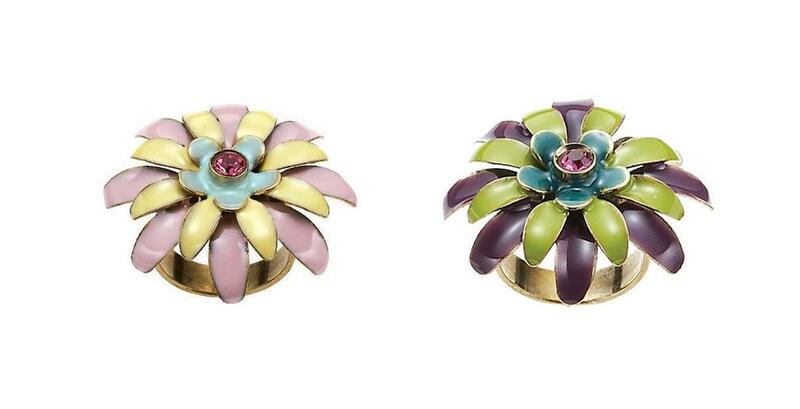 Triple layer flower ring. Swarovski crystal and enamel. Burnished gold plate. The flower measures 3cm/30mm. Adjustable ring band/shank (5mm wide). Beautiful flower and jewel embellished necklace. Facted glass drops and beads, quartz beads and drops, Swarovski crystal and enamel. Fabric covered jewel and threaded chain. Burnished gold plate. Adjustable chain 41cm/16 inches to 49cm/19 inches. The various beads/motifs measure from 8mm upto 4.5cm/45mm.